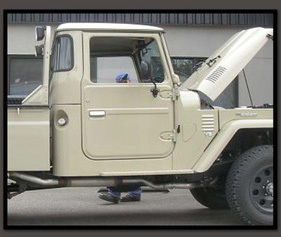 THIS REPLACEMENT ALUMINUM BODY CAB FITS 1978 AND OLDER FJ45 TOYOTA LAND CRUISER PICKUPS BOTH SHORT AND LONG WHEELBASE VERSIONS. 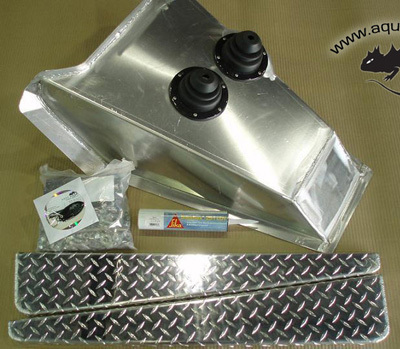 THIS CAB INCLUDES AN ALUMINUM TRANSMISSION TUNNEL WITH SHIFTER BOOTS, ALUMINUM CHECKER PLATE RUNNING BOARDS, AND AN ASSORTMENT OF STAINLESS STEEL HARDWARE FOR INSTALLATION. 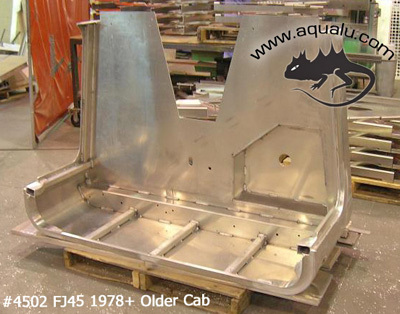 THE CAB ALSO HAS THE DROP OUT PROVIDED FOR THE FUEL TANK ALONG WITH THE EXTERIOR FUEL FILLER. IT IS CONSTRUCTED FROM 5052 MARINE GRADE ALUMINUM ALLOY THAT IS 5/32″(.156″) THICK.